Need a recipe for dessert success? 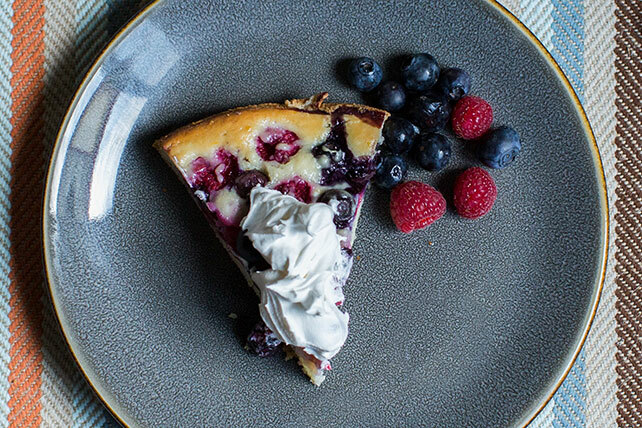 Just pile mixed berries atop a fluffy, citrusy cake and add a dollop of luscious COOL WHIP. Beat reduced-fat cream cheese and 1/2 cup sugar in large bowl with mixer until blended. Add egg whites and zest; mix well. Combine 1 cup flour and baking soda. Add to cream cheese mixture alternately with sour cream, beating well after each addition. (Do not overmix.) Spread onto bottom and 1 inch up side of 9-inch springform pan sprayed with cooking spray. Toss 2 cups berries with remaining sugar and flour; spoon over cream cheese mixture to within 1/2 inch of edge. Bake 40 to 45 min. or until toothpick inserted in center comes out clean. Run knife around rim of pan to loosen cake; cool before removing rim. Spoon remaining berries over cake. Serve topped with COOL WHIP. Garnish with powdered sugar just before serving.